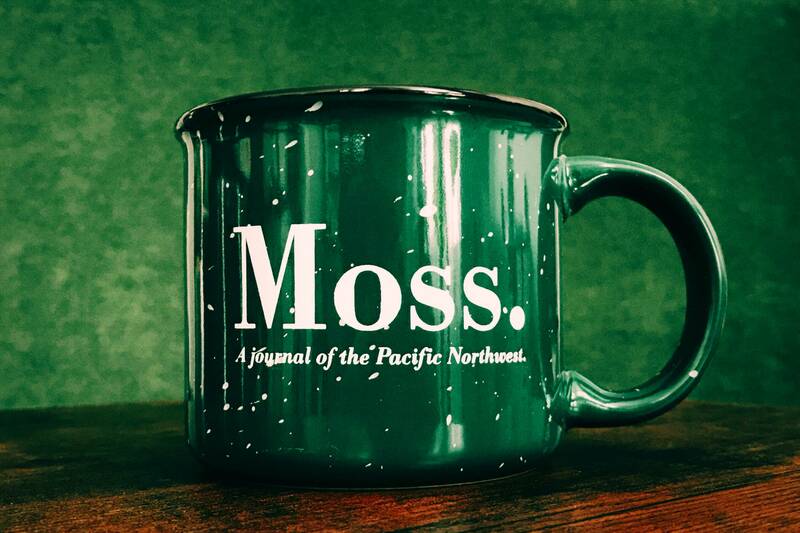 Moss is creating a journal of the Pacific Northwest. MOSS: VOLUME FOUR is coming soon! Subscribe by May 5 and be the first to receive the new print edition in June 2019! Moss is a literary journal of Northwest writing. Published annually, Moss is dedicated to exploring the intersection of place and creative expression, while exposing the Northwest region's outstanding writers to a broad audience of readers, critics, and publishers. Since its debut issue in the summer of 2014, Moss has received praise for its sharp design, strong editorial hand, and its commitment to supporting new and emerging writers. 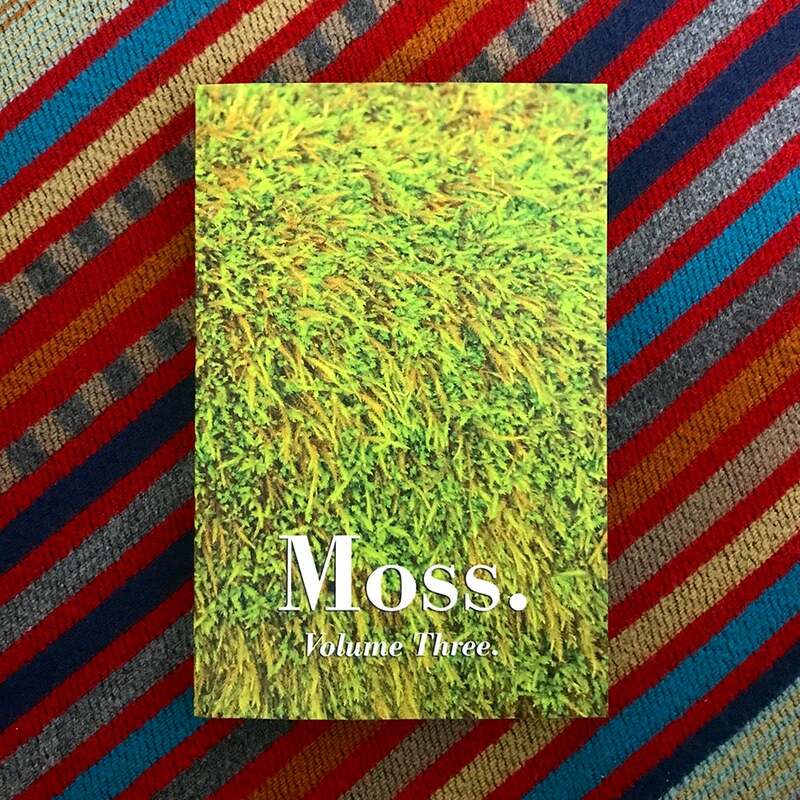 As The Seattle Review of Books put it, "Moss is at the vanguard of modern Northwest literature." Moss has also been covered by The Rumpus, Literary Hub, Longreads, The Millions, The Offing, The Stranger, Seattle Weekly, City Arts, and The Portland Mercury, among other publications, and is stocked in print at independent bookstores across the country. We pay every writer we publish, and make all of our work available online for free. 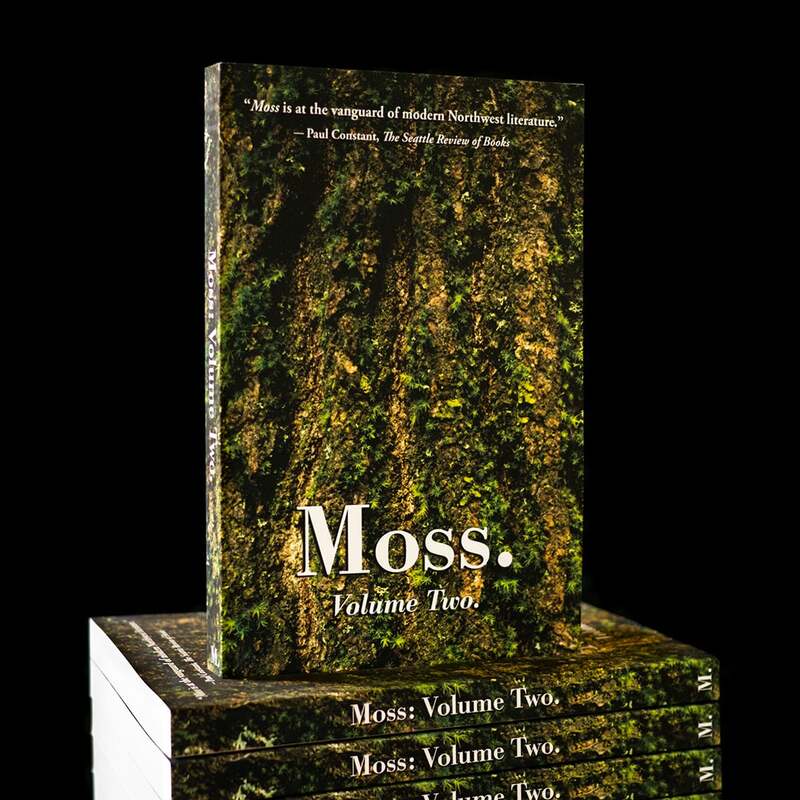 Our next anthology, Moss: Volume Four, will be released in June 2019, and include work and interviews from more than two dozen Northwest writers, including Quenton Baker, Tara Atkinson, Stephanie Wong Ken, Mattilda Bernstein Sycamore, Michelle Peñaloza, Kamari Bright, Brandon Jordan Brown, Ruby Hansen Murray, J.C. Sibara, Maya Jewell Zeller, Nicola Griffith, Jessica Mooney, Natalie Villacorta, Matt Greene, Anis Gisele, Sarah María Medina, Savannah Slone, Kelli Russell Agodon, Ian Denning, Megan Snyder-Camp, John Englehardt, Chelsea Dingman, Shankar Narayan, Juleen Eun Sun Johnson, and Dawn Pichón Barron. Writers we've published and interviewed in past issues include Rebecca Brown, Mitchell S. Jackson, Corinne Manning, Tiffany Midge, Leni Zumas, Jane Wong, Shawn Vestal, Donna Miscolta, Ishmael Butler, Nikkita Oliver, Kristen Millares Young, Keya Mitra, Rich Smith, Joe Wilkins, Shankar Narayan, Kathleen Flenniken, Heather Jacobs, Jasleena Grewal, E.A. Greenwell, Dave Roth, Emily Ruskovich, Mercedes Lawry, Kate Lebo, Tara Robert, Richard Chiem, Sharon Hashimoto, Amber Krieger, Laura Da', Azura Tyabji, Troy Osaki, Amanda Coplin, Janie Miller, Elissa Washuta, Kelly Froh, Alexis M. Smith, Leah Sottile, Miriam Cook, Matt Briggs, Monet P. Thomas, Jenn Blair, Eric Wagner, Gina Williams, Peter Mountford, Anca Szilagyi, Michael Upchurch, Leyna Krow, Ryan Boudinot, Donald J. Mitchell, Christine Texeira, Clayton McCann, Chris McCann, Robert Cantwell, Nate Liederbach, T.V. Reed, Charles Finn, Kjerstin Johnson, Eric Severn, Steven Moore, and Sonya Chung. Since 2016, we've used Patreon to offer annual subscriptions. Subscribing to Moss is the best way to get the print edition, stay up to date on our latest releases, and support our core mission of publishing, celebrating, and supporting Northwest writers. For only $20 a year, subscribers get the print edition shipped to them before it hits shelves. For those who want to make an extra contribution to support the Northwest literary community, two higher-level tiers offer additional rewards. For more information on the subscription levels, check out the Rewards column to the right of the screen. The subscriber-funded Volumes Two and Three, in all their glory. WHAT IS PATREON? HOW DOES IT WORK? Patreon is a crowdfunding platform a bit like Kickstarter, but with a twist: rather than facilitating one-time campaigns, it’s a platform designed to support ongoing creative work. Unlike on Kickstarter, pledges are collected on an ongoing basis—whenever a project is completed—rather than when a goal number is met. In our case, we collect pledges once per year, one month prior to the publication of our annual anthology. The next anthology we release will be Moss: Volume Four in June 2019. The subscription period for this anthology will close on May 5, 2019. Those who subscribe prior to that date will have their pledges collected, and will receive a copy of the book (along with the other rewards below, for higher-tier subscriptions) as soon as it's printed. Moss: Volume Four will be available to the public in July 2019. Though Patreon does collect your payment information immediately, subscribers will not be charged until the end of the subscription drive. Subscribers will only be charged once per year. We will always provide ample warning before the subscription is billed. Q: The final step on the Patreon checkout page makes it sound like my pledge will be billed monthly. What gives? I thought this was an annual subscription?! A: We understand the confusion, so to emphasize again; you absolutely will not be billed monthly. Subscribers are only charged once per year, when the annual print edition is released. Unfortunately, we do not have control over the language on Patreon's checkout page, which is generic and does not differentiate between 'billed per creation' subscriptions (like Moss) and 'billed monthly' subscriptions. If you have any further questions about this, please don't hesitate to reach out to [email protected] - and thanks for your trust and patience with our subscription system. Infrastructure. Most subscription platforms are built around a monthly cycle; Patreon’s “pay per release” system gives us more flexibility, and lets us make sure you’re only charged when we publish a new volume. They also take care of credit card processing and fees, collecting shipping information, and much more. Community. Like Kickstarter, Patreon lets us connect directly with our readers for support. We will never turn our publication model over to advertising or corporate interests; subscribers like you help us maintain both our creative integrity and the quality of the reading experience. Sustainability. The subscriber base we've built on Patreon has helped to provide long-term, sustainable funding, ensuring that Moss can continue to publish great work far into the future. Though our book and merchandise sales help to cover some of our printing expenses and writers' fees, Moss does not make (or seek) a profit, and our all-volunteer team relies on subscribers like you to keep us going. WHAT'S UP WITH THE REWARDS? perfect for a damn fine cup of coffee. Moss was founded by Connor Guy, a book editor in New York City, and Alex Davis-Lawrence, a filmmaker and creative producer based in Los Angeles. Both were born and raised in Seattle. To keep up with Moss on social media, find us on Twitter and Facebook. Whether or not we make our funding goal, the yearly anthologies will still be printed, we'll still pay every writer we publish, and all our subscribers will receive their full set of rewards. Since the beginning, Moss has been funded largely out-of-pocket; our launch, development, and first three issues were entirely self-funded, and we will continue to do what is needed to keep Moss running and growing. A Volume One sticker, at home in Seattle's Kerry Park. Receive one copy of the annual print anthology (starting with Moss: Volume Four in June 2019), shipped to your door before it hits stores, along with our new stickers. One copy of the annual print anthology (starting with Moss: Volume Four in June 2019), special thanks on the website, a limited edition Moss mug, and a full set of our six new stickers. Two copies of the annual print anthology (starting with Moss: Volume Four in June 2019), special thanks as a Patron in the print edition and on a special section of the website, the full set of six stickers, two Moss mugs, and one pound of locally-roasted Northwest coffee (roaster to be announced)! This goal covers the cost of printing our annual anthology, including writer's fees, layout, and shipping/distribution, as well as Patreon's fees, and the cost of producing and shipping our subscriber rewards. Special events, web hosting, special publications, multimedia projects, and other costs are supported by additional in-store and online book sales.